The state of Texas reserves the right to govern how much water can be pumped in order to protect its aquifers. That is, in some parts of Texas. 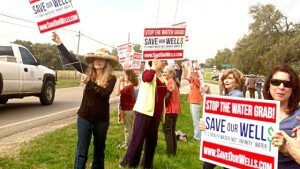 Western Hays County residents protest Electro Purification water grab near Hays City Store. Photo by Bill Johnson. When Houston based company Electro Purification received the rights for 1,3000 acres of land just outside the central Texas town of Wimberley, they planned to build seven test wells. Because the land that these wells are on isn’t part of any groundwater conservation district, they are outside of the state’s jurisdiction, so whoever owns the land can lease the water rights. In the long run, Electro Purification plans to pump more than 5 million gallons of water per day from aquifers to supply nearby growing suburbs. Electro Purification insists that the situation in Hays County is not a “water grab” and is perfectly legal. Furthermore, Electro Purification Ed McCarthy says that the water is used for “beneficial purposes”. For those on the receiving end, like the city of Buda, it truly is beneficial. Just half an hour outside of the Capitol, Buda has been struggling for water resources for six years. Under their agreement with Electro Purification, Buda will receive 1 million gallons of water every day through one of the pipelines. A company has a moral obligation to use water and develop water at a sustainable rate. There has been speculation that the loophole that Electro Purification found proves that there is no moral obligation. 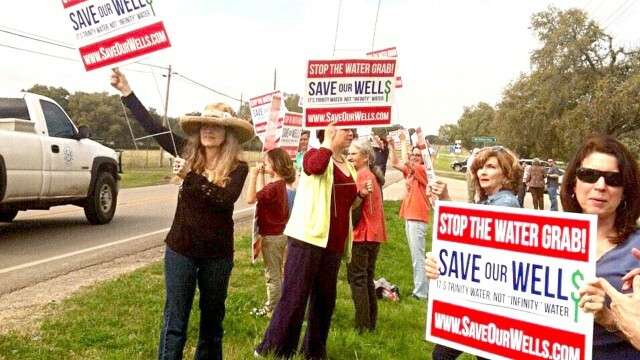 Meanwhile, locals are holding meetings, hosting take action websites, and starting a “Save Our Wells” campaign.